Just a short drive, but a world away, from the hustle and bustle of the theme parks, your real Central Florida adventure begins at Holly Bluff Marina. We are located at the end of a peninsula along the St. Johns River in DeLand, an unspoiled piece of paradise situated between Daytona Beach and the Orlando area attractions. Rent a pontoon boat or houseboat to experience a unique journey away from the crowds. Cruise the river and explore crystal blue fresh water springs where manatees spend their winters, see live alligators and turtles basking in their natural habitat and watch exotic birds take flight. Delightful surprises await around every turn of this special part of Florida. Already have a boat? 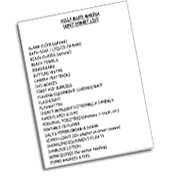 Holly Bluff Marina offers transient or full time wet and dry storage, a service department specializing in Volvo Penta marine engines and Westerbeke marine generators, travel lift services, pump-out station, launching ramp and marina store. 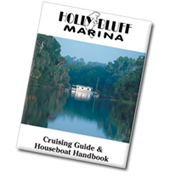 Holly Bluff Marina is a family owned and operated business. Rick and Judy Armstrong purchased the marina in 1992. Prior to moving to Florida, their family owned a large resort on the Kentucky Lake. Their daughter, Jennifer Armstrong, helps manage Holly Bluff Marina and Judy’s brother, Steve Moore, is the Yacht Broker. They all live on property and are easily accessible to customers and guests.